With so many puppy foods available, it's hard to know which foods are high-quality. 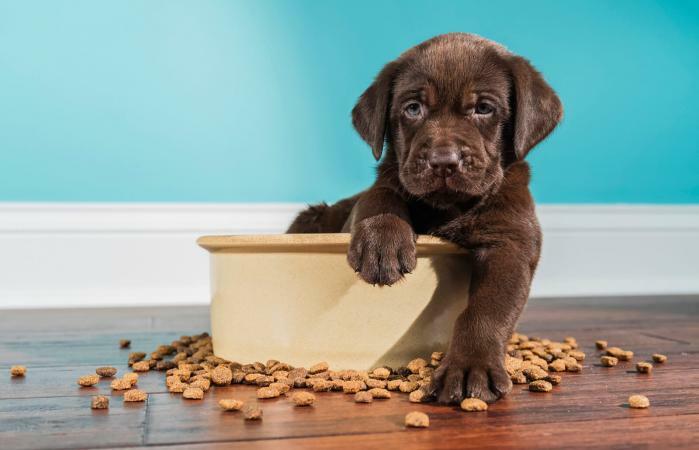 American Association of Feed Control Officers (AAFCO) suggests puppy food contain at least 22.5 percent protein, 8.5 percent fat, and no more than 4 percent fiber. No matter what food you choose, follow these guidelines for the best dog food for your puppy. Fromm Family Foods is a top pick due to its wholesome ingredients and the vast choice of flavors. There are five recipes, including two large-breed formulas, with tasty flavors sure to please any pup. While nutritional content varies based on the flavor, each formula is made of high-quality ingredients. For example, Heartland Gold Puppy is grain-free with beef, pork meat meal, lamb, and many vegetables, vitamins, and probiotics. Their food contains at least of 27 percent protein and 18 percent fat with no more than 6 percent fiber content. The Barkpost raves about its "awesome ingredients and grain-free options, the vast array of recipes, and great price for the quality." Reviewers on Petflow.com give the food 4.9 stars out of 5, and 97 percent would recommend the food. Customers were happy their puppies liked it, and this was a big selling point for the food. A 5-pound bag is about $14. Smaller dogs, especially toy dogs, are at risk for hypoglycemia and should be given food formulated for their unique needs. They also need smaller kibble because it's easier on their growing teeth. An excellent choice for small breeds is Wellness Complete Health Nutrition Dry Small Breed Puppy Food, Turkey, Salmon, and Oatmeal. The top ingredients in Wellness Complete puppy food include deboned turkey, chicken meal, salmon meal, oatmeal, ground barley, ground brown rice, and chicken fat. Wellness Complete has smaller kibble size, extra DHA to promote healthy brain and eye development, and also contains probiotics. Many Amazon.com users note that the food came recommended by their vets. It's also highly rated on dog information site, My Sweet Puppy and on Dog Food Advisor. A four-pound bag on Amazon is about $15. Just like small dogs, large dog breeds do best with a food formulated for their needs. The best large-breed puppy food should have a nutritional formulation that takes into account the large breed's risk for conditions like hip dysplasia as well as bloat. Because Taste of the Wild High Prairie Puppy Formula does just this, it is one a top food for large and giant breed puppies. The food is grain-free and top ingredients include pasture-raised roasted bison and pasture-raised roasted venison. The food also boasts species-specific probiotics, salmon oil (which provides much-needed DHA), dried chicory root (a prebiotic), and antioxidant-rich fruits and vegetables. The protein content is 28 percent, fat is 17 percent, and fiber is no more than 5 percent. Chewy.com users rate the food 4.8 out of 5 stars, and 97 percent say they would recommend it to other puppy owners. Reviewers rave that their dogs love the food. Canine Journal also notes Taste of the Wild Foods to use only ingredients that are hormone free, thus recommending it over other natural food options. A 30-pound bag at Petco will cost about $50. For most puppies, the best food is dry kibble because it has a higher meat protein content than wet or semi-moist food. However, you can mix canned food with kibble for an extra treat and to provide more moisture. A top choice for canned puppy food is Wellness Complete Health Just for Puppy. Top ingredients include salmon, apples, flaxseed, chicken broth, chicken, and chicken liver. The protein content is at least nine percent, fat is at least six percent, and fiber is no more than one percent, with 78 percent moisture. The manufacturer claims the food is suitable for all breed sizes. Wellness Complete gets an A+ rating from Dog Food Guide for its primary ingredients (quality chicken and salmon) and notes the added DHA and omega fatty acids for healthy development are a bonus. It's also recommended by Fidosavvy.com and gets five stars from reviewers on Petsmart.com. A 12-pack of 12.5-ounce cans is about $30 and a 24-pack of 6-ounce cans is about $50. The quality of food you feed your puppy is an important factor in choosing the best food. Read labels, research reviews, and talk to your veterinarian to make an informed choice. Make sure you track your puppy's weight to see if you may be feeding your pup the right amount.